Endless OS is a Debian-based Linux for users who might not have access to the Internet. Even in the 21st century, some regions do not have continuous Internet access. Many of these Net-less areas are in third-world countries, but even in the United States, it is not uncommon for residents in smaller towns and rural regions to lose service for hours or even days. The creators of Endless OS believe users in areas with weak or non-existing Internet access are an underserved market. The company, which goes by the name of Endless , has a combined hardware/software solution designed for beginning users in environments that can't depend on the Internet. The Endless product line consists of a Debian-based Linux distro tailored for the company's low-access use case and a collection of mini-computers to run the system. The system is designed to use an ordinary TV as a monitor. The operating system is Linux under the hood, but, unlike most modern desktop systems, which are increasingly dependent on the cloud, Endless OS is prepackaged with a collection of tools intended for a standalone environment. According to the company, Endless OS comes with 100 preinstalled applications, videos, and lectures on academic subjects, and an encyclopedia with more than 50,000 entries. If you are thinking Endless OS might be aimed at an educational environment, you would be correct. A video at the company's website shows the system in use with a variety of third-world classroom settings that look like Africa and South America. However, Endless OS requires way more modern conveniences than the bare-bones One Laptop per Child (OLPC) system, which came with its own foot pump for human-generated electrical power. Endless OS is intended for a user that might not have Internet access but does have fixed housing, a power supply, and a TV. The Endless OS developers are deeply involved in the open source scene. Endless is a member of the Gnome Advisory Board , and the company is also active in Debian Derivatives . Endless was founded in 2011 as a Kickstarter campaign , and it currently has subsidiaries in San Francisco and Rio de Janeiro. On the hardware end, Endless offers two mini-PCs with a spherical design. The smaller version costs $79 or $99, depending on the equipment level, and the larger version costs $189 or $229. The smaller sphere PC, dubbed the Endless Mini, has an Intel Celeron CPU clocked at 1.5GHz with 1GB RAM, 24 or 32GB flash memory, three USB 2.0 connections, HDMI port, Ethernet, and audio. The larger Endless One comes with a 2.17-GHz Intel Celeron, 2GB RAM, a 500GB hard disk drive, Gigabit LAN, two USB 2.0 ports, and a USB 3 port. The PCs use a TV with HDMI input as a display; Endless OS is preinstalled as the operating system. The software side of the combined solution is the recently released 3.0 version of Endless OS. The developers make the system available for free download independently of the alternative PC. 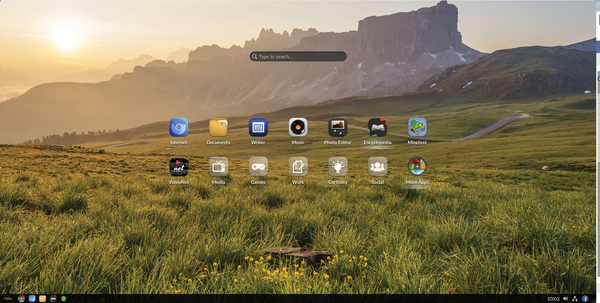 Endless OS is based on Debian GNU/Linux 8 "jessie" and a customized Gnome desktop (Figure 1). Figure 1: Endless OS's interpretation of the Gnome shell looks very different from the ones you may be familiar with in standard systems. The 100 preinstalled applications do not require Internet access. 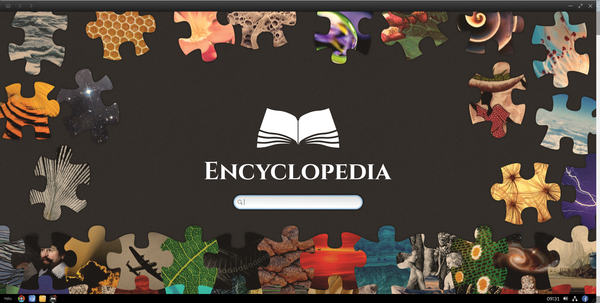 The on-board encyclopedia is basically an offline version of Wikipedia (Figure 2). You can control the system through an App Center, which, much like the download tool for a smartphone, lets users install apps and app bundles by pressing large icons. Figure 2: The encyclopedia integrated into the system also works without an Internet connection. Endless OS is designed to be visually intuitive. Users click directly on the desktop to start an application; the menu, which most desktop environments use for orientation and navigation, is only used for accessing the settings. Thanks to a site-specific browser (SSB) , users can create web pages for local access from the desktop. The company offers compressed Endless OS images in a basic version of about 2GB or a full version with 13GB. The unpacked image of the full version requires about 20GB space on disk, whereas the smaller version takes up just under 6GB. The full version is used on the larger of the two PCs. The image can be transferred directly to a USB flash drive and started from there. To use it in VirtualBox, you have to convert it into a VDI image up front. The Endless Installer for Windows lets you download the image and requires at least Windows XP. It then creates a bootable USB stick. The new version 3.0 of Endless OS is also suitable for parallel installation with Windows. A YouTube video points out the right approach . We put both versions of Endless OS through a short test. We used dd to copy the smaller version to an 8GB USB stick, and we converted the larger into a VDI file for VirtualBox (see the "Converting VDI" box). The following description assumes an installed VirtualBox, which Oracle provides free of charge for private use. At the command line, convert the base image using the command from the first line of Listing 1. Then, expand the space available on the virtual system with the call from the second line – in our example, we went for 30GB. Then create a virtual machine in VirtualBox, add your generated image as a virtual disk, and start the system. Both versions launched without any problems and only differed in terms of scope: For example, the smaller variant is missing the encyclopedia, although you can install it retroactively as a Flatpak.